This page last updated April 21, 2006. 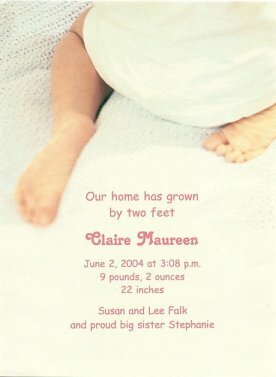 Claire Maureen was born at 3:08 p.m. on June 2, 2004 at Innovis Hospital, six days before she was due. At 37 weeks, I was measuring big so at my 38 week appointment we had an ultrasound done to determine the size of the baby. We found out at this time that we were having a girl. 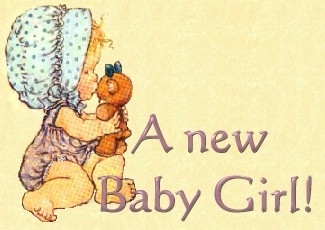 Until this day, we had planned to use the name Camille Maureen in the event of a girl. Once we knew for sure, we started talking about the name again. The ultrasound indicated our little girl was weighing in at about 9 pounds. My doctor, Terry Burrell (a male midwife! ), said the ultrasound could be 1 pound off either way. Being that Stephanie and Arthur were both over one week late, he suggested inducing me the following week. With babies gaining about ½ a pound a week, if the baby was 9 pounds at 38 weeks, we would have been looking at an 11 pound baby. He said he would rather deliver an 8 pound baby a week early than an 11 pound baby later. I wholeheartedly agreed with him! I went into the hospital on May 30, 2004 in the evening, the day before Memorial Day, for the inducement. They applied some gel to my cervix that night and that began the pitocin Monday morning bright and early. At about 5:00 p.m., Terry had the pitocin turned off for the night as I was not advancing very far or very quickly (only about 1-2 cm). We repeated the same process, gel Monday night and pitocin bright and early Tuesday morning. I dialated to about 3-4 cm on this day, but even after Terry broke my water at about 2:00 p.m. things did not progress. Again at about 5:00 p.m., Terry had the pitocin turned off for the night. It was supposed to get started up again at about 2:00 a.m. but the floor got busy with deliveries so it did not get started until about 6:00 a.m. By 9:00 I was having pretty good contractions and at 11:00 I asked for an epidural. I had not had one with my daughter or my son, but after three days of this process I was exhausted. At 3:08, Claire was born. She was a little stubborn about coming into the world. Part of the reason my labor did not kick start with the pitocin right away was that Claire refused to engage her head in my cervix. She was not fully engaged until shortly before she was born actually. Terry told me it was probably a good thing I had the epidural because until shortly before delivery Claire had been face up and had I pushed at all she may have gotten stuck that way, unable to turn around. The nurse, Lois, enjoyed giving Terry some grief because he assured me that the baby would not be 9 pounds. Little Claire just had to start off her life proving someone wrong, weighing in at 9 pounds, 2 ounces and 22 inches. We were both released from the hospital Friday, June 4, 2004. After over five days at the hospital I was more than ready to leave! The photo links will take you to Claire's picture pages. You can keep clicking on next for the most recent pictures until you come back to this page. When you're back here you have finished viewing the pictures. I try to update with pictures at least once a month so come back often and check to see if there's more! *NEW* pictures added May 16, 2006.